Four-year-old Marcella Marino asked her Daddy to make her look like a princess for her school photo. 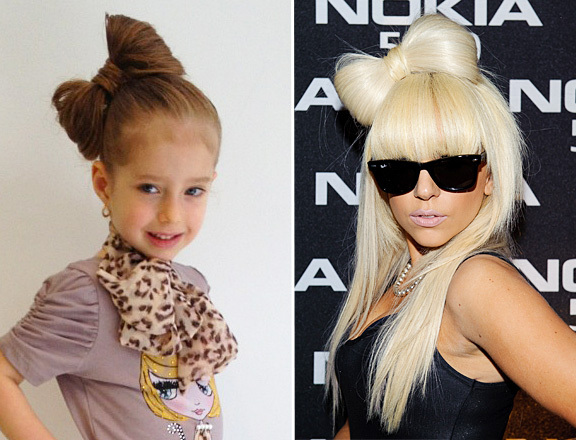 Her father, a hairdresser in Kent, England created a Lady Gaga inspired bow for the occasion. Unfortunately, the school has a strict policy against braids and hair bows and banned her from having her picture taken with her class. The photo shoot has been rescheduled, after being cancelled due to a mix-up with the photographer. Fast food chain Carl’s Jr. is testing an ice cream concoction resembling a hamburger. 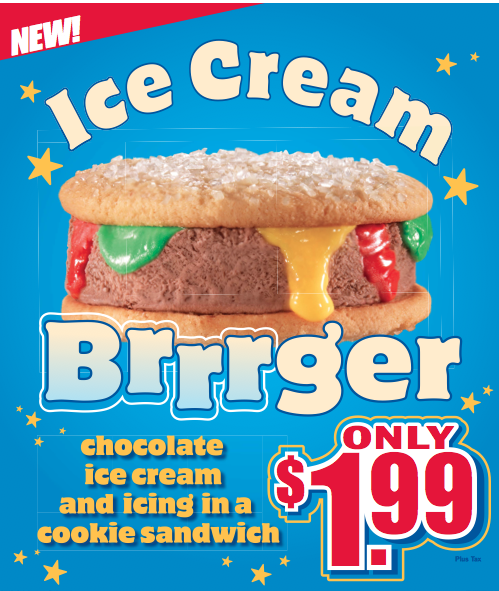 Dubbed the “ice cream brrrger,” the dessert sells for $1.99 at select locations in the Orange County, California area. The “brrrger” consists of 2 sugar cookies as the bun, chocolate ice cream as the meat, and drizzles of colored icing in red, yellow and green, to depict mustard, ketchup and we assume lettuce. While the item looks pretty unappetizing, and is rumored to look even less so in person, I can think of way more disgusting things to eat than a poorly designed ice-cream sandwich. Carl’s Jr. says it will analyze the test data and decide if it will roll it out to the balance of the chain in the future. This weekend marked the unofficial start to Summer. We had an indoor picnic with lots of summery salads and a light fruity dessert. Our mini strawberry shortcakes and Grand Marnier marinated strawberries were accompanied by a scoop of this homemade strawberry and coconut milk sorbet that is so easy to make, you don’t even need an ice cream maker to do it! 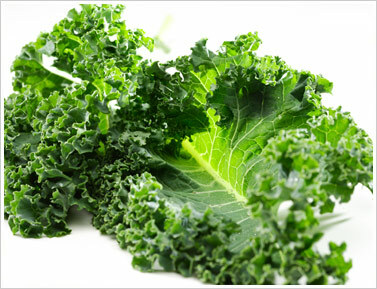 Toss all the ingredients into the blender, and puree until smooth. Add a dash of vodka ( not enough to taste it!) to prevent the mixture from freezing too solidly. Freeze until ready to eat and enjoy! My nephew is currently serving in the military, at a remote base in Afghanistan. When he wrote that they did not have access to fresh foods, such as fruit, vegetables or dairy, and only received 2 dried meals per day, I set out to find things that I could send him to keep him healthy during his deployment. At first I sent the obvious; boxed chocolate milk, protein powder, “power bars”, and pouches of pureed apples with bananas or carrots. Then one day while trolling the aisles of Whole Foods, I stumbled upon Orgain, the perfect meal replacement that is shelf stable, nutritious, and could survive being airlifted by helicopter if necessary. I wrote to the company and told them about the less than ideal circumstances that my nephew was experiencing, and how thrilled I was to find their product. They immediately replied that although were just a small start-up company, they would like to help. They graciously offered to ship their product to him and his entire team with their thanks for the sacrifices they were making for their country. I can’t thank them enough for their generosity and kindness. It is not just a company with a great product, but also one with a big heart. As we speak, 72 boxes of Orgain are making their way to an army base somewhere in the mountains of Afghanistan, enroute to providing sustenance to a handful of men and women who are risking their lives on our behalf. I guess they have a lot in common with those who will soon be receiving their gift. This Memorial Day, please take a moment to give thanks for our fallen heroes, and for those who are currently serving. They, like Orgain are doing more for the world than the world is doing for them, and they are doing it with pride and dedication. I’d say they’re pretty successful, wouldn’t you? Everything is getting the designer treatment these days, and food is no exception. It’s not trendy enough to just eat sushi, now we need to design the seaweed wrappers too! Japan’s Umino Seaweed Shop has created rolls of nori (the seaweed that sushi is wrapped in) that are laser cut into designer patterns. Five precut designs are available, each based on an element of Japanese symbology. Custom coffees and text messaging have become an obsessive part of our lives. Now you can receive a message in your half –caf soy latte and kill two birds with one stone! Seattle based cloud texting company Zipwhip, has created Textpresso, a machine that can not only send and receive text messages, but can print them in your coffee foam too! Zipwhip has merged the espresso machine with an android app that has SMS capabilities, and installed a printer stocked with edible ink. It can print short messages in your coffee foam, to personalize your morning joe. What will they think of next? Any ideas? When our daughter was a baby, Dr. Sears was a prominent childcare author, as was Dr. Ferber, who wrote about sleep training. All of our friends were “Ferber-izing” their babies, and using his process of letting the children cry until they fell asleep, even if it took hours. His theory was that once they figured out that their parents weren’t coming to hold them or feed them again, they would learn to self-soothe and just go to sleep on their own. As I poured through the volumes of child rearing books given to me when we were expecting B, I was struck by one thing. If you read enough of them, you will find one that agrees with what is comfortable for you as a parent. We brought B home from China when she was just over a year old. Everything was unfamiliar to her. The sights, sounds, and smells were new, as were these 2 people who were to be her parents. In my opinion, it was more important for her to learn that we were there for her and would always take care of her, than it was for her to fall asleep alone. And boy did we pay for that! When all of the other parents were having quiet evenings together, and sleeping through the night, I was sitting in a rocking chair, softly singing (off key of course!) and offering bottles. This went on every night, all night. For a few years, I literally got about 3 hours of interrupted sleep per night. I could hear the softest little utterance on the baby monitor, jump up from a deep sleep and run down a flight of stairs to pick her up, in what could well have set Olympic records for speed. I rocked and rocked, and when my rear end became numb, I carried her around the house, hoping she would fall asleep. B slept in my arms, waking only if I tried to put her down. Sometime around 6 a.m. Daddy would take over, and the two would snuggle up on the couch and fall into a deep sleep. I would crawl to the gym and head off to work, only to return around 7p.m. to serve a “family dinner”, bathe her, read to her and start that whole nightmare all over again. It is amazing that I functioned, but mothers are invincible at that point. Was it wrong to go through all that? Who knows? The road to becoming a parent was a long and emotional one, and I convinced myself that I was making up for all the lost time she spent without me in the orphanage. I also assumed that this time was precious and short, and that soon she would not want me around. Earlier in the evening, when I ask about her day, I get very little response. “What did you do in school today?” I ask. “Nothing” she replies. “How was your field trip?” I ask. “Boring” she replies. But later, while we lay together in her twin bed, she tells me all about the things that are going on in her life, and sometimes we giggle, usually at her father’s expense. She falls asleep pretty quickly now, and sleeps through the night. Is it just as strange that I put a 12 year old to bed, as it is that someone else is breastfeeding a 4 year old? Not to me. Am I Mom Enough? Hell yeah! Artist Victoria Selbach logged on to her computer one morning and discovered her Facebook account had been disabled due to “objectionable content.” With no prior warnings or notification, it was puzzling. She filed an inquiry with Facebook, but received no response. Selbach, an artist whose hauntingly beautiful and tasteful nudes were featured here previously, reached out to her network of realist artists, who rallied around her. They posted her dilemma on their own walls, with a link to her website. Selbach’s site traffic soared to more than 6000 hits over night. It is a sad commentary on our culture, when fine art is considered objectionable, but someone’s drunken party photos are not. Neon worn with neon is a bit much. Mix one great intensely colored piece with something more subtle. Black can be harsh with strong neon colors and takes us back to the 80’s. To look completely modern, mix neon with white, grey, beige or denim, for a less jarring effect. Stripes can also be a great foil for all the strong color. Head to toe neon can be overwhelming, but soft whitened versions of the same color family can work really well together. Try a soft pink with a neon pink, or a pale green with an acid green. Just a touch of neon in an accessory can be an instant update without making the whole outfit loud. 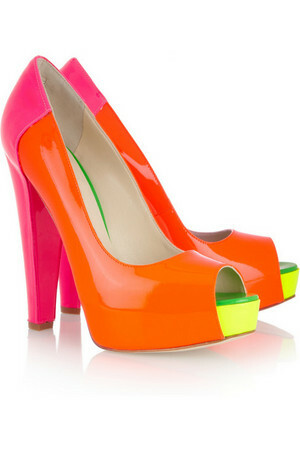 Look for neon shoes, belts or bags as a great way to lift any outfit. Neon nail polish is a short term commitment. 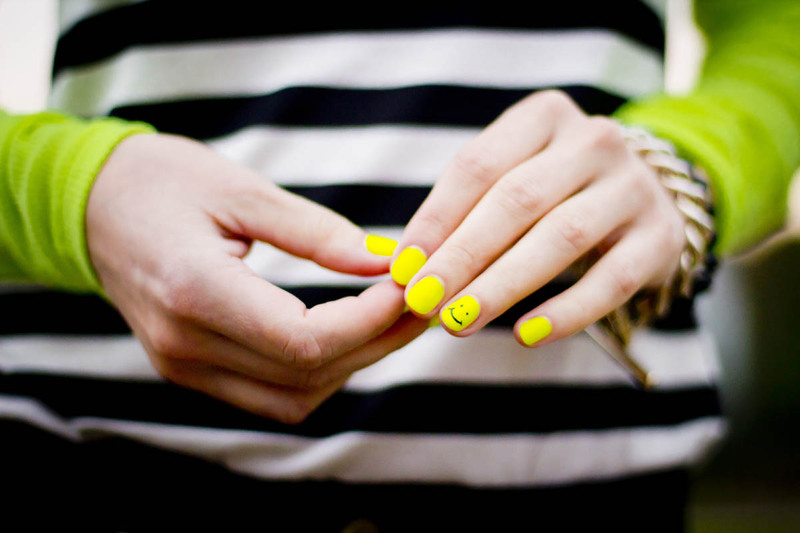 Try a little on your fingers or toes for a fun, temporary trial on the trend. We all know the obesity rate in the United States is climbing rapidly. This epidemic is attributed to over eating and under exercising, right? Well, maybe it’s more than that. According to an article on the Co. Design website, it could be what we eat, not how much we eat that is having an adverse effect on our waistlines. While the article acknowledges that Americans consume more calories than any other country in the world, it isn’t substantially more. The average American consumes 3770 (!!!) calories per day and spends about 6.9% of their income on food. Currently 34% of the population is considered obese. Just as a reference point, it takes 3500 calories to make a pound and the average salary in the U.S. is $46,326 per year. That means about $8.75 per day is spent on food. Comparatively, Italians eat 3660 calories per day, and spend 14.7% of their income on food. Italy’s obesity rate is 15%. So what’s contributing to the difference? It seems that Americans are obsessed with cheap food sources. In the 1950’s mechanized foods, such as canned, frozen, and fast foods were considered a sign of our country’s progressiveness. Cheap, processed foods became a source of pride for our nation. Other countries held fast to their cultural traditions, and continued to enjoy their national cuisine. Using the freshest and finest ingredients to produce regional delicacies is far more costly than the pink slime consumed in our country. Although it is clear that 3770 calories a day is way too much, especially when the average American is fairly sedentary, it appears that the quality of our food may play as great a role as the quantity we consume.